The Coral Coast begins 15 kilometres south of Nadi town. A new highway runs past sugar cane fields and Caribbean pine plantations missing much of the coral beauty until it descends towards Yanuca island and one of Fijis largest beach resorts which is also the headquarters for the sole dive operator catering for the luxury resorts and budget accommodation places along this spectacular stretch of Fijis principle island. Once past the small township of Sigatoka and the village of Korotogo, the highway joins the coast and runs beside the beautiful lagoon. There are 14 resorts, hotels and motels along the Coral Coast as well as budget places, including a village set up to cater for visitors. 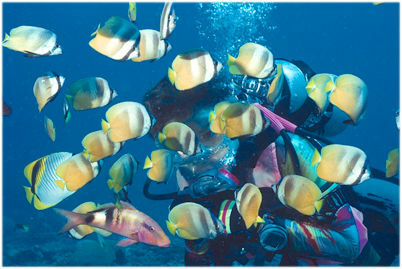 Daily pick ups by the operator takes divers to the various dive sites. This includes vertical walls festooned with soft corals and gorgonia fans and fish life on the outside of the main reef and in the passages. Wonderful area for family holidays as the diving is incredibly accessible and it is possible to enjoy two dives in the morning and spend the afternoon with the family. A wide range of restaurants, shopping and excursions up to the Sigatoka Valley to pottery villages and historic sites.